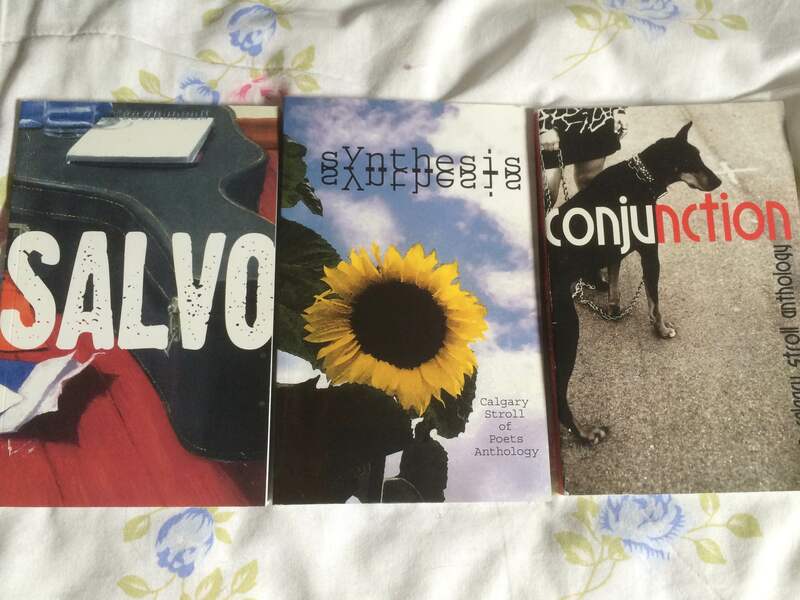 My first publishing credits were as a poet, where I appeared in three anthologies over the course of the same number of years with the Calgary Stroll of Poets. It was a nice trip down memory lane to pull these off the shelf and review the work that they published. They were interesting pieces of poetry. One was about a trip to Moscow that never happened. Another, a reflective poem about what some of my old nightly prayer lists looked like when meditating. The third poem published was inspired after a Jazz Album by Bassist Steve Swallow and Vibraphonist Gary Burton. “Hotel Hello”. I turned it into some story about pulling into a dive motel and staying the night. Poetry was my first realization that I could write. My old notebooks from my teen days offer great reflection into things I was thinking and going through during those days. My memory is good enough that I can usually recall what and who the subjects of my words were. In a few instances I actually would write down who the piece was meant for or what location it was meant to be about. Leonard Cohen’s marvelous body of poetic work was encouraging. They all stand as reminders to writers that you should write what you want and to be comfortable with your own identity within your writing. Another book that inspired my work on more free-form styles of verse was The Tragically Hip Frontman Gord Downie’s, “Coke Machine Glow”. Gord’s book offers some great insight into the poetic mind of a singer making some notes while on the road and living life. He punches several pieces with great use of words in an improvisational yet conversational tone that even new fans of poetry could appreciate. I highly recommend this great collection of poems. These are the moments where I will open the first few books I ever wrote in and reflect fondly on my early forays into the business and craft of writing words. It is always a trip and a half. Seeing names of people and places, and guessing the time it has been since those pages were last looked at is something incredible. My progress with writing has always been positive in nature. So it is refreshing to see how far I have come. Everyone should always take a few minutes to reflect and review on older pieces of paper. Not just for the purpose of seeing if there are any old ideas that can be refreshed as updated ones. Just to look at the words. Look at how you wrote them out. Think about how they sound when you read them out. What kind of emotions do they provoke in you? What kind of emotions they could provoke in others if they read them and learned they were the subject of those words? I’ve received comments from a few friends and colleagues over the years who ask me why I stopped writing poetry or why I stopped being a poet. After reflecting on it some more, I’ve concluded that I don’t think I ever did stop. Because I never stop being a writer. At least once a year I still gather some submissions to send to literary publications in the hopes of adding another credit to my resume. Most times they are older pieces of poetry and prose that are given some new life. Much of the notebooks and loose pages where ideas are kept could easily be turned into poetic verse. I’ve come to the realization that maybe my ideas all start out as poetry before transitioning into something else. If I wanted to, I could generate collections for the rest of my career based on just what I have around me and never need new ideas. Thankfully, new ideas never stop. So my abilities to write create poetic verse never stopped either. Posted in Notes from the Frogpond.Tagged books, Calgary Stroll of Poets, collections, Gord Downie, learning, Leonard Cohen, note books, places, poems, poetry, publishing credits, Tragically Hip, writers, writing.